Technical training and retraining for artists and printmaking professionals seeking a comprehensive working knowledge of non-toxic printmaking techniques, including a study of methodology and aesthetic applications. In the advanced certificate in non-toxic printmaking, you’ll learn the fundamentals of print creation, and applied skills for current and emerging industry and career demands. Students incorporate industry best practices and principles through the design and production of printmaking projects. This is part one of a two-part advanced certificate in non-toxic printmaking for highly motivated students who are able to sustain their work independently. This course is designed to introduce basic non-toxic printmaking technical concepts that may also include techniques such as Intaglio-Type, A.R.E., screen, relief, monoprint, digital transfer, halftone, photo, and the art of the master printer. The focus will be on non-toxic intaglio printmaking research and how to creatively apply techniques that will result in works of art. This is part two of a two-part advanced certificate in non-toxic printmaking for highly motivated students who are able to sustain their work independently. This course is designed to introduce advanced level non-toxic printmaking technical concepts that may also include one or more of the following techniques; Intaglio-Type, A.R.E., screen, relief, monoprint, digital transfer, halftone, polyester plate litho, photo, and the art of the master printer. The focus will be on non-toxic intaglio printmaking research and how to creatively apply techniques that will result in more sophisticated works of art. 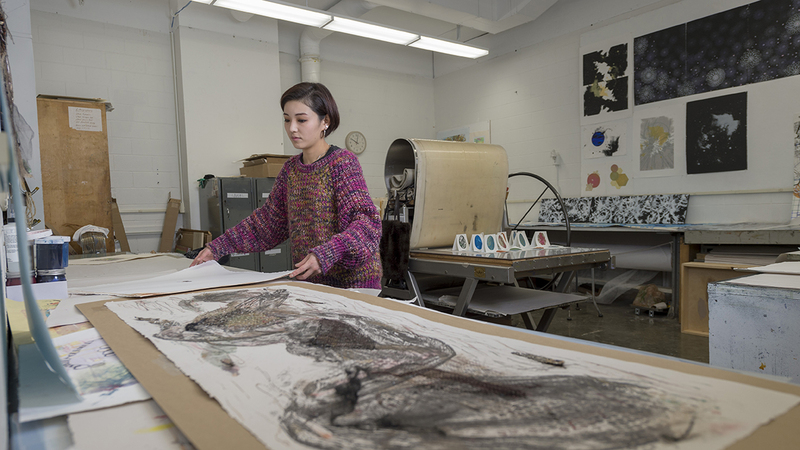 Hold a BFA or MFA, or be recognized as a master printer or professional print maker. Submit a slide portfolio (betwen 10-20 slides). Information regarding costs and the U.S. Department of Labor’s Standard Occupational Classification (SOC) code and occupational profiles for this program can be viewed at www.rit.edu/emcs/financialaid/gedt/non-toxic-printmaking.html.